Following a catastrophic disaster, you and the community may be on your own for a period of time because of the size of the area affected, lost communications, and un-passable roads. 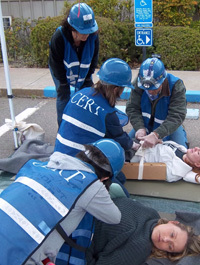 CERT training is designed to prepare you to help yourself, your family, and your neighbors in the event of a catastrophic disaster. Because emergency services personnel will not be able to help everyone immediately, you can make a difference by using this training to save lives and protect property. The two week course covers basic skills that are important to know in a disaster when emergency services are not available. With training and practice and by working as a team, you will be able to do the greatest good for the greatest number of victims after a disaster, while protecting yourself from becoming a victim. CERT volunteers use cribbing and leverage to stabilize debris and safely extricate a victim. Working in teams, volunteers must organize themselves with a crew leader, safety person, and crew members who can listen carefully and follow directions. The class is taught by firefighters who make it a challenging but fun exercise while emphasizing the importance of rescuer safety. CERT classes offer classroom and hands-on instruction in fire suppression, taught by firefighters from Ashland Fire and Rescue. Fire and Hazmat topics are covered first in the classroom, then you will practice hands-on use of a fire extinguisher. Participants need protective gloves, goggles, long pants and closed shoes for this exercise. For HAZMAT (hazardous materials) the CERT standard equipment includes binoculars to recognize and get away or STAY AWAY from hazmat incidents, so that they do not become victims themselves. CERT volunteers spend several hours in the classroom learning disaster triage, how to set up a medical area in a mass casualty incident, how to do basic first aid, and how to safely transport injured victims out of the disaster area. You are trained to take care of the injured and keep track of them until they are transported by ambulance. All medical classes are taught by firefighter-paramedics.